This book gives proofs for the Vedic methods from Tirthaji's book that Tirthaji himself did not show. Also proofs of other significant results and new applications that came to light during the composition of the book. 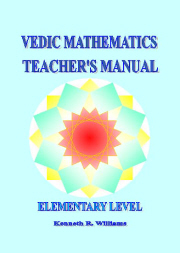 This book has been written to meet the need to formally and comprehensively verify the techniques of the system of Vedic Mathematics. The system was reconstructed from ancient Sanskrit texts by Sri Bharati Krsna Tirthaji (1884-1960) between 1911 and 1918. He wrote sixteen books expounding the system which were subsequently lost. In his old age he wrote an introductory volume "Vedic Mathematics" which was published in 1965. Though some have rejected the system on the grounds that it is not confirmed as 'Vedic' there is no doubt that Bharati Krsna's book is a remarkable work. To those who have carefully studied it, it is full of new ideas and indicates a wonderful and unified approach to the study and teaching of mathematics. It is truly refreshing to see an author who not only loves his subject and has such a fundamental grasp of the foundations of mathematics, but is uncluttered and unaffected by conventional approaches that often tend to obscure the naturally coherent structure of mathematics. Sri Bharati Krsna Tirthaji's original text included proofs of many of the methods shown. But some needed to be generalised or were missing altogether: in this volume we attempt to fill in the gaps. So here we do not include Bharati Krsna's proofs but offer only what is required to complete the validation. There has been a need for such a book for a long time as this establishes Bharati Krsna's work from a mathematical perspective. Some proofs presented quite a challenge because, as you may know, the Vedic methods are extremely original and often very unusual and unexpected. On the other hand, our proofs threw up some variations of the methods and Sutras that have not been noticed before. So we are pleased to include those here. Another way in which we have gone beyond the content of Bharati Krsna's book is in including material from authors who have developed the original methods and Sutras into new areas or new variations, but which have not been formally proved before. Each chapter of this book has its own introduction which indicates such material as well as making other pertinent points about that chapter. Growing interest in the remarkable system of Vedic Mathematics in recent years has led to the need to have all the Vedic techniques formally proved. This book therefore establishes the validity and scope of the Vedic system, and given the unusual and almost magical innovations that the original author (Sri Bharati Krsna Tirthaji) left us with, it will be no surprise to learn that some of the proofs required considerable ingenuity to create. Mathematical proofs not only authenticate a technique, they also show up their range of application. A consequence of this is that the process of acquiring the proofs has led to new applications and variations which were not noticed before. These new applications are shown here for the first time. When Bharati Krsna was asked “Is this mathematics or magic?” he replied “It is both. It is magic until you understand it; and it is mathematics thereafter”. This book therefore reveals the secrets of how this magic works.